Congratulations to Marc Fialkoff who successfully defended his PhD in Planning, Governance, and Globalization on Monday. Marc’s research focused on quantifying the effect of the Jones Act restriction on freight transportation networks in the aftermath of Hurricane Sandy. His research blended civil engineering, law, network science, and planning to analyze the impact of a law on critical infrastructure. Marc’s committee represented the interdisciplinary nature of transportation policy, with committee members from Urban Affairs and Planning, Civil and Environmental Engineering, Law, and Network Science. I served as co-chair Marc’s committee with Ralph Buehler, along with committee members Kathleen Hancock, Henning Mortveit, and Jonathan Gutoff. 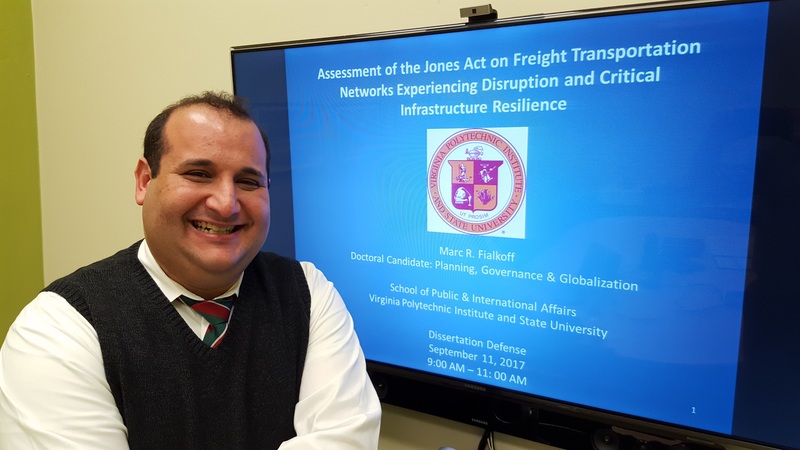 In addition to being an interdisciplinary study of law, policy, and freight transportation, Marc’s research leveraged a collaborative partnership between the School of Public and International Affairs at Virginia Tech with Oak Ridge National Laboratory (ORNL). As part of his research, Marc spent a year with the Critical Infrastructure and Climate Change team at ORNL, under the supervision of Dr. Olufemi Omitaomu, collecting data and analyzing the impacts of the law on the highway and railway networks. Using tools developed by ORNL researchers, Marc connected his background in law and planning with technical expertise to evaluate law and policy decisions on freight transportation. Most recently, Marc was selected as an Eno Fellow by the Eno Center for Transportation in recognition of his interdisciplinary approach to studying problems in transportation research. Marc’s research is timely in the aftermath of Hurricanes Harvey and Irma to inform decision-makers as to the impact of relaxing the Jones Act and its implications on the freight transportation network. It is the first study to externalize the Jones Act as a legal lever for influencing recovery within the freight transportation system. In October 2012, Hurricane Sandy caused massive disruption and destruction to the Mid-Atlantic region of the United States. The intensity of the storm forced the Port of New York and New Jersey to close, forcing cargo diversion to the Port of Norfolk in Virginia. Because of the Jones Act restriction on foreign vessels moving between U.S. ports, the restriction on short sea shipping was viewed as a barrier to recovery. Much of the critical infrastructure resilience and security literature focuses on the “hardening” of physical infrastructure, but not the relationship between law, policy, and critical infrastructure. Traditional views of transportation systems do not adequately address questions of governance and emergent behaviors such as resilience. In contrast, recent development of a System of Systems framework provides a conceptual framework to study the relationship of law and policy systems to the transportation systems they govern. Applying a System of Systems framework, this research analyzed the effect of relaxing the Jones Act on freight transportation networks experiencing a disruptive event. Using WebTRAGIS (Transportation Routing Analysis GIS), the results of the research demonstrate that relaxing the Jones Act had a marginal reduction on highway truck traffic and no change in rail traffic volume in the aftermath of a disruption. The research also analyzed the Jones Act waiver process and the barriers posed by the legal process involved in administration and review for Jones Act waivers. Recommendations on improving the waiver process include greater agency coordination and formal rulemaking to ensure certainty with the waiver process. This research is the first in studying the impact of the Jones Act on a multimodal freight transportation network. Likewise, the use of the System of Systems framework to conceptualize the law and a critical infrastructure system such as transportation provides future opportunities for studying different sets of laws and policies on infrastructure. This can provide policymakers and planners with a more robust opportunity to understand the impact of law and policy on the infrastructure systems they govern.